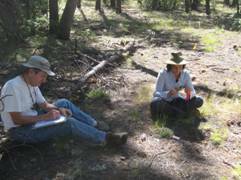 Between September 21 and September 27, 2008, 17 Passport in Time (PIT) volunteers (Figure 1) joined Kaibab National Forest archaeologists for a project along the rim of Sycamore Canyon to measure average thickness of 'Deadmans Gray' potsherds. The goal was to test Daniel Sorrell's 2005 Northern Arizona University thesis, "Temporal Significance of Attribute Variations in San Francisco Mountain Gray Ware." Sorrell found that Deadmans Gray increases in thickness from A.D. 700-1150. According to his study, if archaeologists can obtain average sherd thickness from 50 Deadmans Gray sherds in a single component site, they can date the site within +/- 40 years. In 2006, archaeologists conducted a similar study on Pueblo III (late Cohonina) sites in the Upper Basin near the Grand Canyon, and found their results agreed with Sorrell's thesis (see the "Investigating Cohonina Migration in the Upper Basin" (2006) summary, also listed under Arizona projects on the 'Previous Projects' page). Because chronological controls are poor in the Sycamore Canyon Rim area, Kaibab archaeologists hoped to collect data such as these to compare to their findings in the Upper Basin. Since 1990, Kaibab archaeologists working with David Wilcox have discovered 6 ball courts along the "frontier" area between the Southern Sinagua, Prescott, and Cohonina culture areas. These basalt-cobble paved, oval-shaped features have two entryways and measure, on average, to 50x25 meters. Based on the absence of Pueblo I pottery (no Lino Black-on-gray or Kana'a Black-on-white), and the absence of Pueblo III pottery (no Flagstaff Black-on-white or Sunset Red), Kaibab archaeologists have believed that most of the Sycamore Rim area was occupied during the Pueblo II period, also known as the Medicine Valley phase (Christensen, Hanson, Sorrell and Weintraub, 2006). To implement Dan Sorrell's sherd thickness study, archaeologists queried a database to determine sites most likely to contain at least 50 Deadmans Gray sherds. 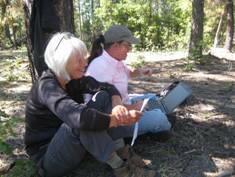 During the PIT project, Kaibab archaeologists led crews of three to four volunteers to each of the sites, where recorders then pin-flagged 50 Deadmans Gray sherds. When crews visited sites with hundreds or even thousands of Deadmans Gray sherds, they conducted multiple studies. Each crew split duties evenly. One person used Neiko 6" digital calipers to measure the thickness on four corners and the center of any given sherd. The other person then recorded the readings on a sheet (see Figure 2). The volunteers switched after each had measured 25 sherds. At the end of the day (or sometimes in the field when a laptop was available) crews entered the data into an Excel spreadsheet, which then averaged the five readings on each sherd and calculated an average thickness of each data set (see Figure 3). Table 1 lists the results below, and includes both the average and the expected site occupation date derived from Sorrell's linear and quadratic equations. *Blue color indicates thickness values outside range of expected dates. **Bold numbers indicate average of sites with multiple readings. During the project, crews measured sherd thickness at 17 sites (including all six ball courts). These sites ranged from single-room, masonry outlines to sites with multiple structures and features. As expected, it was found that all of the thickness values post-dated the Coconino Phase (A.D. 700-900). However, researchers were surprised that seven of the 17 sites dated well into the Pueblo III range (post-dating A.D. 1100), despite the absence of ceramics from that time period. These results are contrary to the belief that the Cohonina completely abandoned the Sycamore Rim area after A.D. 1100 (Christensen, Hanson, Sorrell, and Weintraub, 2006). Based on the thickness values, three of the ball court sites date well into the 1100s A.D. (Wagner Hill, Buzzard and JD). This may indicate that while most Cohonina migrated from the area prior to A.D. 1100, some may have remained, or at least returned seasonally. It is also plausible that trade networks broke down and such assemblages never made it into the study area. In addition to conducting the analysis at the sites listed above, archaeologist Michael Lyndon led crews on a 210-acre block survey of southwest of JD Dam. Lyndon's crews found two new archaeological sites: Site 03070102693 and Site 2694. Both are described below. 03070102693: This site consists of a large Pueblo II Cohonina site consisting of at least 4 structures (Figure 4), and other phenomena such as rock piles and possible linear features. The site is located on a low ridge in thick oak vegetation with some ponderosa pine. Thick oak leaf litter indicates a higher density of artifacts may be present than what could be observed during the survey. Ceramics consisted of 15 sherds of San Juan Red Ware (Structure A), 1 Tsegi Orange Ware sherd, 2 Tusayan Corrugated sherds, approximately 50 sherds of Deadmans Gray, 2 sherds of unidentified Brown Ware, 1 possible Rio de Flag Brownware sherd, and 20 Kirkland Gray sherds. Lithics consisted of approximately 50 secondary flakes of Kaibab chert, 1 Kaibab chert side scraper, 2 government mountain biface fragments, 1 2-handed vesicular basalt mano, and 2 non-diagnostic Kaibab chert projectile point fragments. Two of the largest features appear too large to have been roofed, and may represent garden plots or some other non-structural feature type. It is clearly suggested from the surface scatter that the site contains intact subsurface deposits that will yield information important to the prehistory of the area. Archaeologists consider this site eligible for placement the National Register of Historic Places. 03070102694: This site is located on a low ridge between FR 105 and Lee Canyon. It consisted of 6 rock features with an associated artifact scatter that included large amounts of ground stone. The site is approximately 200 meters north of the spring in Lee Canyon in thick ponderosa pine, gambel oak, Utah juniper, Alligator juniper, and other plants such as mullein and yarrow. Ceramics consisted of 60 Deadmans gray sherds, 10 Kirkland Gray sherds, 3 sherds of Tusayan White Ware, 1 Kana'a Black-on-white sherd, and 1 Deadmans Black-on-red sherd. Lithic debitage consisted of a mix of 75 primary and secondary, Kaibab chert flakes, 5 flakes of Government Mountain obsidian, and 4 chalcedony flakes. Abundant ground stone included 8 trough metates and 2 mano fragments. It is clearly suggested from the surface scatter that the site contains intact subsurface deposits that will yield information important to the prehistory of the area. Archaeologists consider this site eligible for placement the National Register of Historic Places. 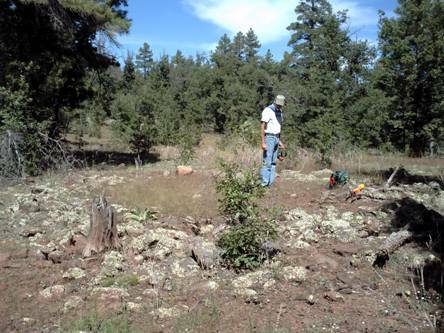 Kaibab archaeologists hope to continue gathering sherd thickness data across the Forest by testing sites in the Cohonina Heartland northeast of Williams, Arizona. It should be noted that Forest archaeologists rarely have time to do such research. 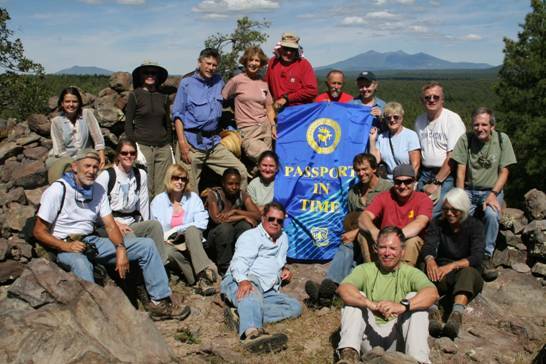 However, Passport in Time projects give them the opportunity to conduct these studies while also sharing the archaeological experience with the public. In addition to the work completed during the sherd study, they surveyed 210 acres, recorded two new, large Cohonina villages, monitored 22 known sites, and conducted all data entry and analysis in the field or back at camp during evening hours. Overall, volunteers contributed 880 hours toward the project. 2006 A GIS Model for Late Pueblo II/Cohonina Multi-Directional Migration from the Coconino Plateau. 2005 Temporal Significance of Attribute Variations in San Francisco Mountain Gray Ware. A Master's Thesis, Northern Arizona University, Flagstaff, Arizona.